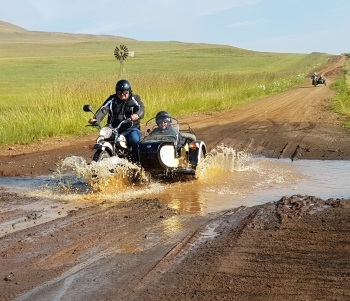 Our annual Sidecar Convention took a new shape this year with all Conventors making their way to Memel where we would be based for 2 days riding routes from there into the surrounding country side. For the life of me I do not know where the word ‘Convention’ came from but it always conjures up images of pencil skirts and brief cases!! 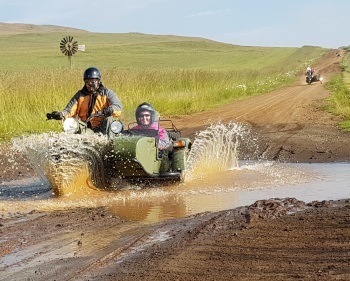 Memel has featured regularly as our go to Camping venue but this year Sidecar Africa decided we can go and Convent there. What a clever little plan it turned out to be. Personally I have ridden the Skyview (our general get to together place) to Delmas road quite a few times in varying weather conditions. It cannot be called pretty but it turned out better than anticipated. Less traffic and fewer potholes – can you believe!! I always wonder if I am just like the frog getting used to the hot water or if the road really had fewer potholes than before? 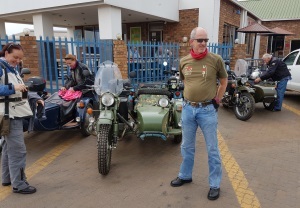 The day’s riding takes us to Delmas for breakfast at the Wimpy and on past Greylingstad to Vrede and voila, Memel! As we rode on and on I thought of the day’s riding in the way we used to eat our suppers when we were kids. First your veggies so you got that out of the way – that would be Skyview to Delmas. Then the views get better so that would be like eating your choppies and rice. It was on this stretch between Greylingstad and Robberts Drift that we had some technical issues. 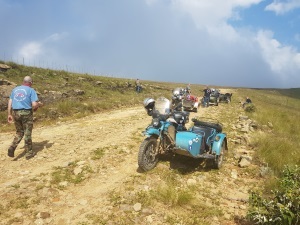 Anzelha had a flat tyre and not long after that a wayward exhaust which was fixed with some bloudraad in Vrede. But what I wanted to say is that while we were waiting we watched a crop duster do his work and then he entertained us no end when he flew over us and gave us a proper buzz and came round again for our entertainment. Made me think he really got us and our sidecars! Bronwen made the point over the weekend that we were becoming more and more like family (with grumpy Oompies and eccentric Tannies – or maybe it is the other way around!) 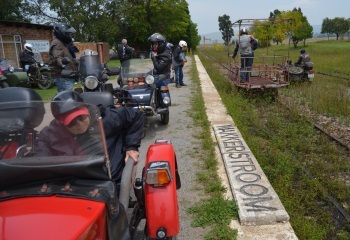 and it really was like that when we arrived in Memel and got to catch up with friends whom we don’t see often. This is probably a good time to say that we missed our sidecar family who could not make the weekend. A few riders and monkeys could not make it this year due to health and work reasons and I want them to know they were sorely missed! Supper on Thursday night was lekker ‘Pap en Wors met Steak en Sous’. Friday morning we had a feast of a breakfast at Marie’s place. She who makes the best Fish Cakes in the world and just looking at the Fruit Salad made my mouth water. The Feta Sundried Tomato and Olive Muffins have me lying awake at night – perfection! I wish she would do a Cooking School weekend – I would be her first little customer. Oh just before I forget, she also made sosaties with little lamb sausage wheels – what can I say!! If you are ever in the Memel area, make a point of staying over with Marie at Cedar Guest House for her fantastic food. 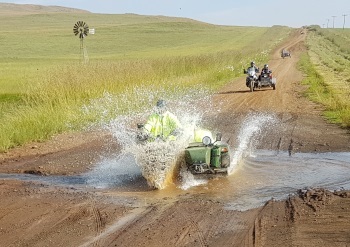 Thank goodness for sidecars! The increased weight just made us more stable! After a photo shoot at the church, we ambled in the direction of Volksrust. 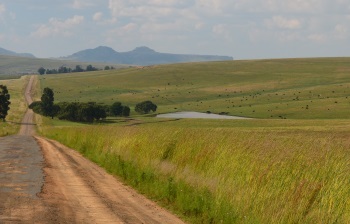 Just after Botha’s Pass and the Padstal we turned onto our beloved dirt roads and country tracks. 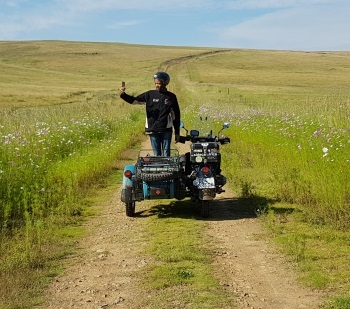 It really was easy riding past the Zaaihoek Dam and the sweeping country views. 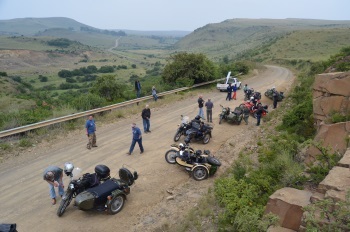 So easy that we arrived in Wakkerstroom way too early after our huge breakfast to have lunch yet. 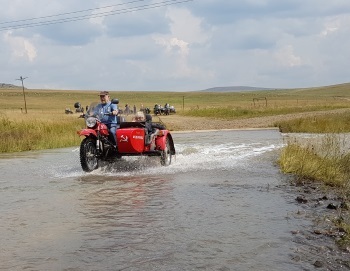 No worries, it was quickly decided that we go and have a look at the Uitkyk Punt and the Wakkerstroom Station. Looking at the road up to the Uitkyk Point we quickly decided that it wasn’t the right day for us to attempt this. The incline would be a challenge. So off to the Station we rode and what fun that turned out to be. 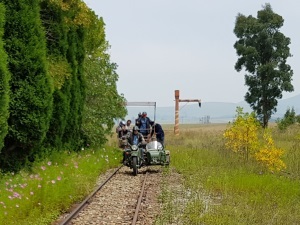 As we arrive I see Kobus and Tess driving round and onto the tracks. 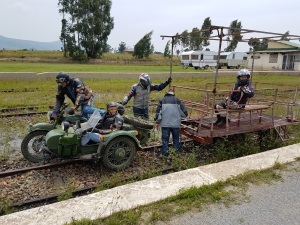 Parked right at the old station is a train car that had been modified for a sightseeing trip. The benches were looking a little tattered, but the car even had cup holders! I still don’t know how I got to be one of the train car passengers – a case of curiosity killing the cat? Anyway, back to Kobus and Tes. 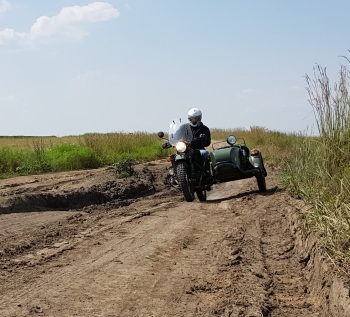 In absolutely no time, a rope had been tied to Kobus’ sidecar and there we were being pulled by a Ural sidecar. It never occurred to me that we would have to stop although I could clearly see the closed gate looming. 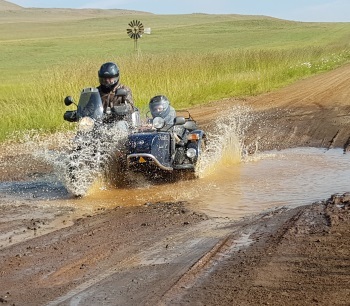 Luckily Frikkie and Isaac had thought about this and we ground to a halt. Of course we had to be towed back to the platform again! 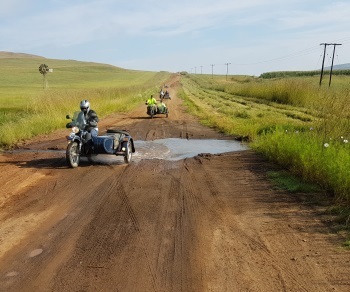 At this stage I was a little more concerned about stopping and also noticed that I was the only passenger without a helmet! 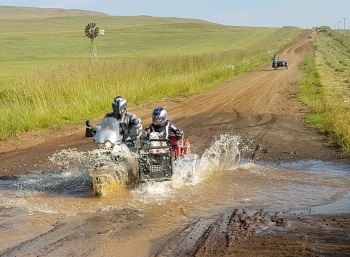 Again Isaac and Frikkie took charge and we came to an impressive stand still as they had found the hand brake. Following our ‘Stasiekapperjolle’ we headed to the Cemetery for some history. 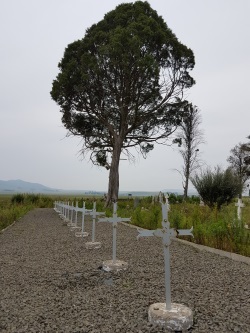 This is a favourite country cemetery of mine. In 2009 quite a bit of work was done to clean up and restore the old cemetery and War graves. It was good to see this. There was a particular headstone that caught my eye. It is the headstone of Emmeline Elizabeth Richards and it ends with:‘Entered into Rest August 23 1910 Her End was Peace’. I decided to be more specific about my exit and aim for entering into rest too. As the day was progressing it became clearer and clearer that my riding boots were entering into rest. 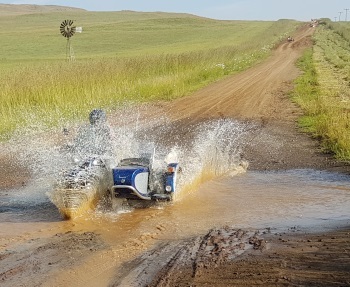 So it was decided that after lunch at the Wakkerstroom Country Inn, we should head to VolksrustAfgri for some new riding boots. Murphy rode with us. We arrive in Volksrust and it is the first Friday of the month. We do manage to find Afgri and the sales lady tried her utmost but my boots would have to put off resting for another day. My dearest other half found boots though and he wasn’t even looking! The last part of the road home was indescribable. I actually worried about losing my grip on the handle bars at one stage. 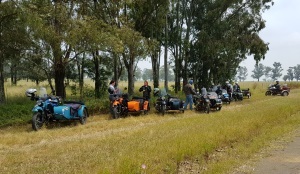 The corrugation was awful and everyone had the same shaken look about them when they arrived back at the hotel in Memel. Kobus had an extra battery for his winch that jiggled loose and fell off. He said he looked down to see this battery bouncing behind and decided it was not worth stopping as the battery would be finished anyway! Friday night’s Chicken Curry at the hotel was perfect. Simple, straight forward and delicious. For me it was a case of ‘magievologies toe’ - so it was an early evening for me. Saturday morning is beautiful. After a no nonsense scramble, toast and bacon breakfast at the Hotel, we get ride ready. Today we would be splitting into 2 groups. The Muller’s Passscenic meandering rambling riders and the Normandien Adventure group. I only rode the one route so cannot confirm if Normandien was the more scenic or not of the 2 routes. What I do know is that Muller’s Pass was one of the easiest riding days in my life. 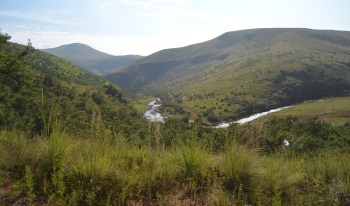 I cannot remember when last I saw so many glistening full rivers and fat Nguni. It was green, green, green. We trundled along cosmos lined country roads. Some of us created some excitement by getting stuck on a concrete pipe and the odd (and only) bit of mud. 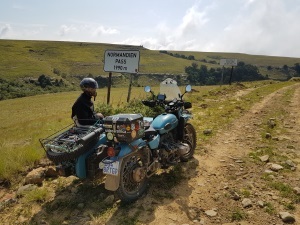 We were riding a circular route towards Collings Pass. At the T-junction before Collings, we waited for the Adventure group to catch up with us. We decided that we would have lunch under the trees waiting for them to catch up. After Collings Pass one rides on the escarpment again and it is just very special up there. There were some interesting storm clouds brewing and the light made the riding very beautiful. I decided to get going and ride. The significant other, same said camera man, gave me directions for the alternative route home but I think his falling into the water and getting wet influenced his route recall? 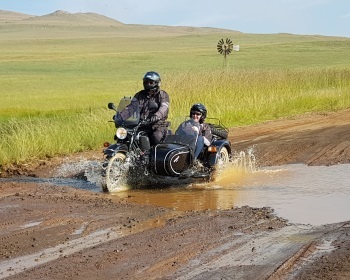 Before we left, Chris from the Hotel had warned us about the monster potholes on the R722 between Verkykerskop and Memel. This was our original leg home so it was decided to ride an alternative route home. You know the feeling when you realize that what you had been trying to avoid so very hard is exactly where you end up being! I had to laugh when I got to a T-junction and it turned out to be the R722 on the Harrismith side of the road! So there I was with visions of cars and trailers disappearing into these potholes and us now having to ride at least 40kms of this! 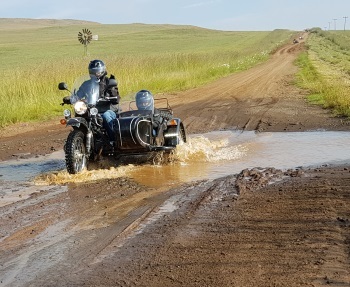 As it turned out it is 5kms of potholes and being on a sidecar is not the same as travelling by car so it turned out to be a non-event! The rest of the road was just magnificent. Pure magic. Earlier I had a little shriek moment with a lightning bolt hitting quite close so I was riding with Queen’s Bohemian Rhapsodyplaying full blast in my head – ‘thunderbolt and lightning very very frightening….OoooohGalileo… Figaro…..’The scenery was literally breath taking with same said storm skies and golden light making for some blissed out riding. 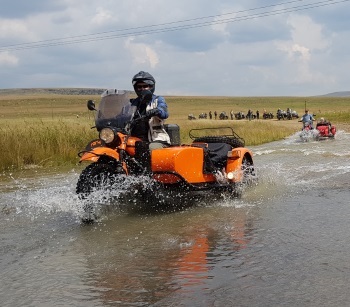 We rolled into Memel in drips and drabs after poor directions and some confusion as to whom to follow - anyway all’s well that ends well and all the ducks and chickens were back in the coup.We concluded that all roads lead to Memel!! Everybody were in high spirits and supper was a noisy affair with the laughter and wine and that storm finally catching up with us. A splendid feast is the only way to describe it. Sunday morning and the early train left at first light. 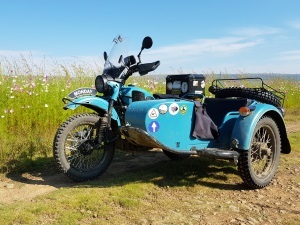 We had said our goodbyes and declared our undying and everlasting devotion and love to our new and old sidecar buds the night before. 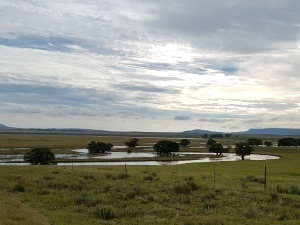 We left Memel literally as the sun was coming over the hills surrounding Memel and as the sun rose almost directly behind us, the first hour and a half was quite other worldly. Beyond beautiful with mist in low areas and spectacular views of the world waking and colouring up. It was properly chilly so breakfast at the Villiers 1 stop was a well-deserved break. Last goodbyes and then it was us and the relentless highway into Joburg past Heidelberg and beyond to our little farm in Hennopsrivier. 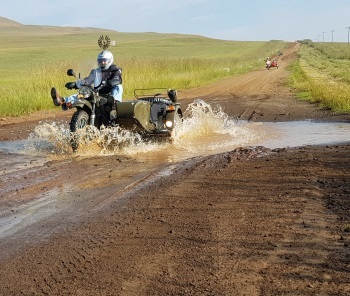 As we turned off onto our dirt road up to Sidecar Africa I felt a huge sense of gratitude and joy. It had been such an easy few days with lots of laughter, good food and beautiful routes. This is exactly what a Convention should be. 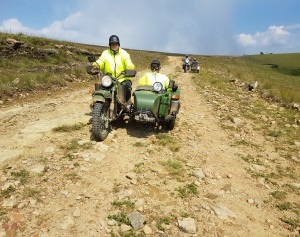 I am already looking forward to riding with the whole sidecar fandamily again next year! Click here to see the splash of the weekend!